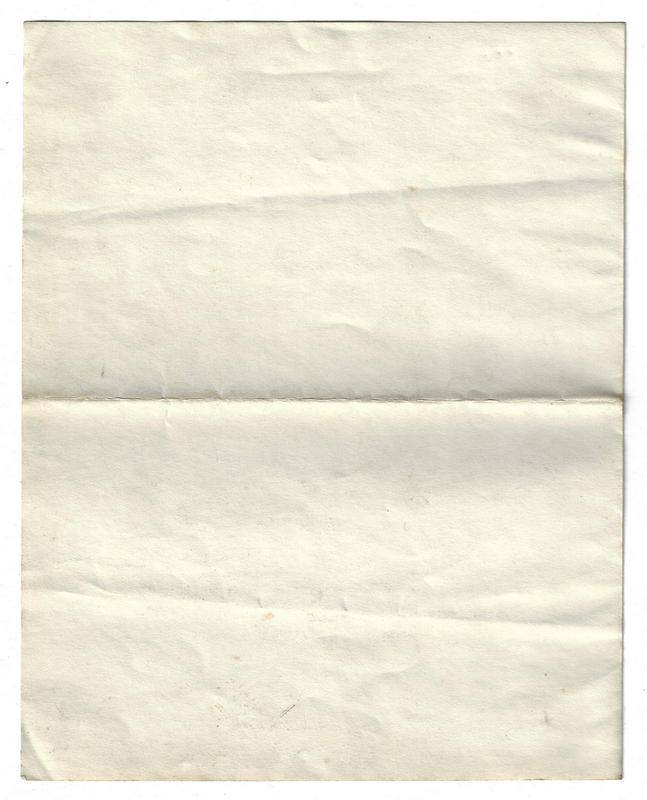 Three (3) President Woodrow Wilson typed letters signed "Woodrow Wilson" as President and written on "The White House" letterhead. The 1913 letters were addressed to Lewis M. Coleman, U.S. District Attorney for East Tennessee, Chattanooga, TN, dated June 24, July 1, and July 24, 1913. 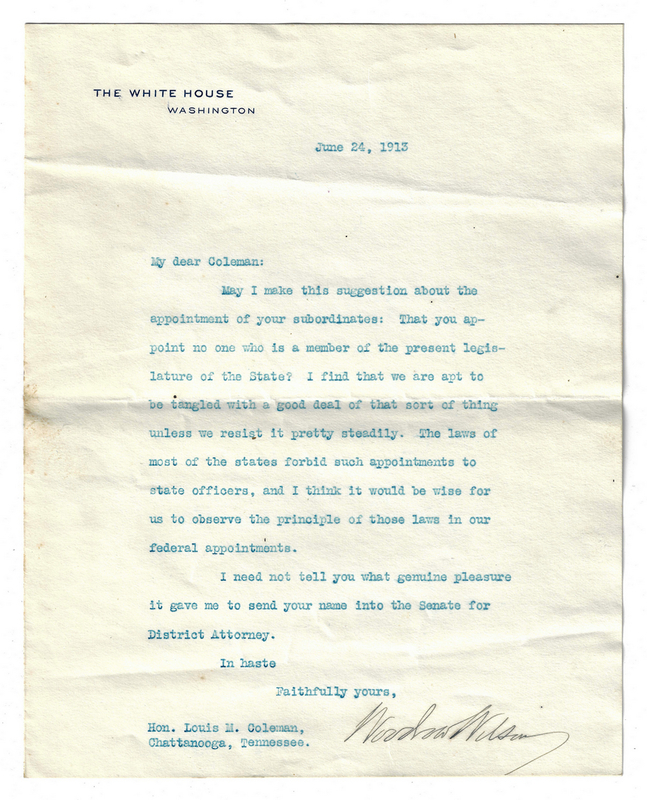 The letters refer to Coleman's desire to appoint State Senator Lewis Shepard Pope (1878-1972) as Coleman's Assistant U.S. District Attorney for East TN. 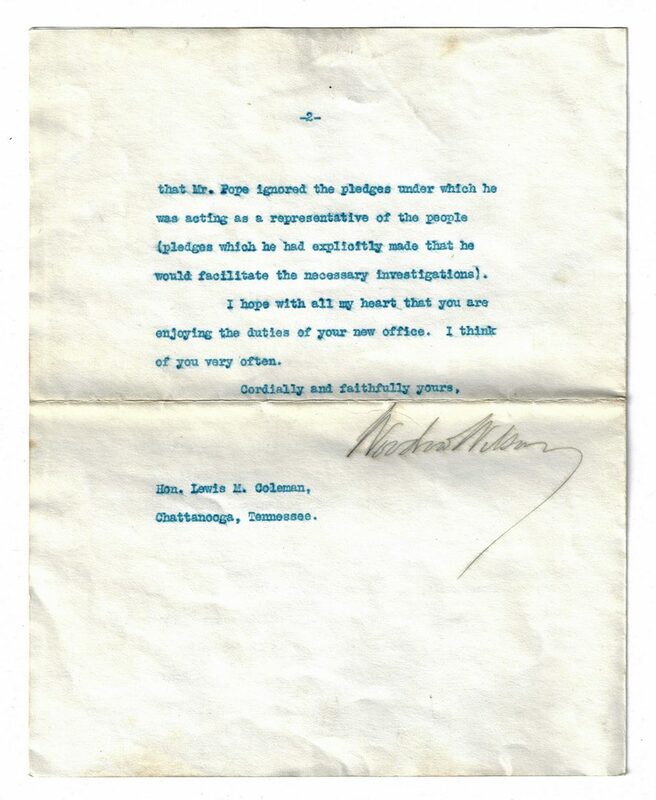 In the June 24 letter, Wilson writes "My dear Coleman, May I make this suggestion about the appointment of your subordinates: That you appoint no one who is a member of the present legislature of the State? I find we are apt to be tangled with a good deal of that sort of thing unless we resist it pretty steadily. The laws of most states forbid such appointments to state officers, and I think it would be wise for us to observe the principle of those laws in our federal appointments. I need not tell you what genuine pleasure it gave me to send your name into the Senate for District Attorney. In haste Faithfully yours, Woodrow Wilson". 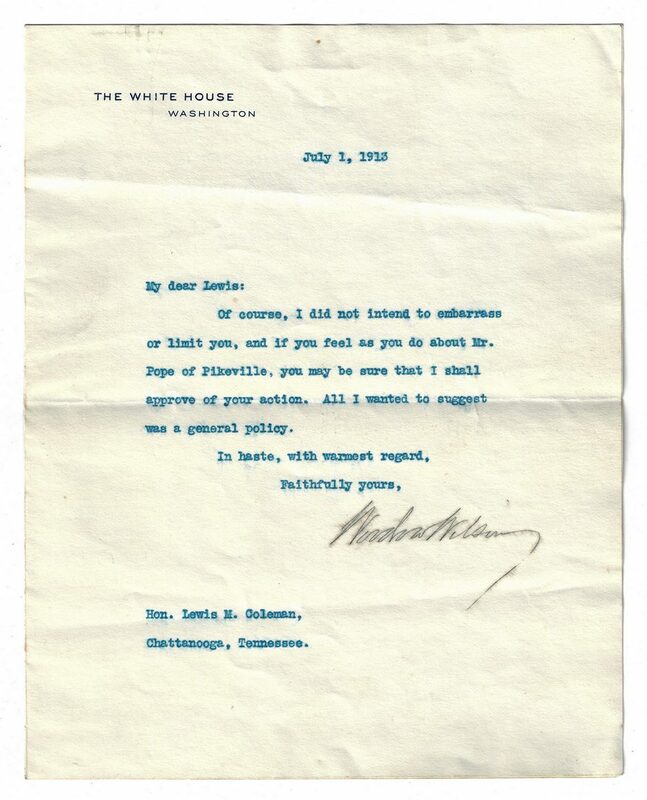 The July 1 letter is a direct follow-up to Coleman's response to the June 24 letter, reading "My dear Lewis: Of course, I did not intend to embarrass or limit you, and if you feel as you do about Mr. Pope of Pikeville, you may be sure I shall approve of your action. All I wanted was to suggest was a general policy. In haste, with warmest regard, Faithfully yours, Woodrow Wilson". 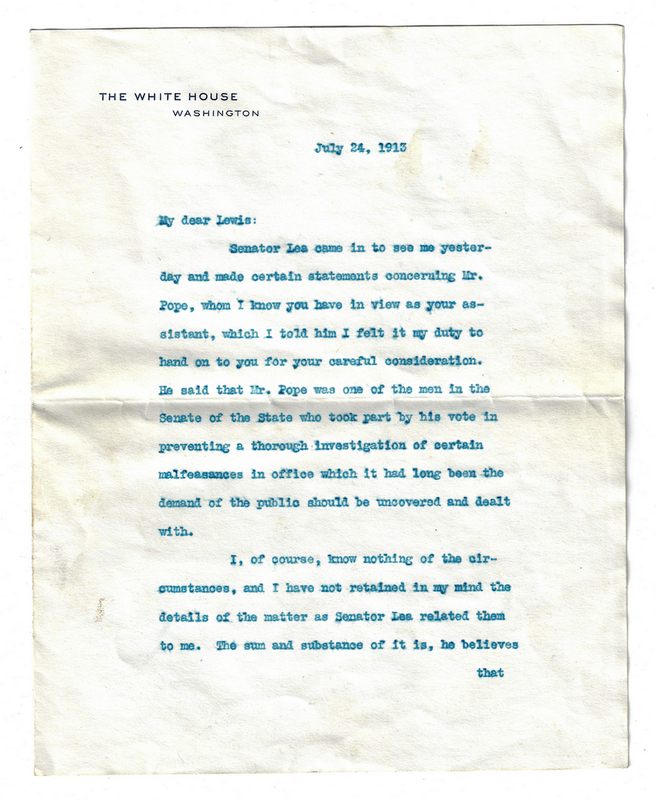 The lengthier July 24 letter reiterates Wilson's reservations regarding Pope's appointment, stating "My dear Lewis: [Tennessee] Senator [Luke] Lea ([1879-1945)] came in to see me yesterday and made certain statements concerning Mr. Pope…He said that Mr. Pope was one of the men in the Senate of the State who took part by his vote in preventing a thorough investigation of certain malfeasances in office which it had long been the demand of the public should be uncovered and dealt with. I, of course, know nothing of the circumstances, and I have not retained in my mind the details of the matter as Senator Lea related them to me. The sum and substance of it is, he believes that Mr. Pope ignored the pledges under which he was acting as representative of the people (pledges which he had explicitly made that he would facilitate the necessary investigations). I hope with all my heart that you are enjoying the duties of your new office. I think of you very often. Cordially and faithfully yours, Woodrow Wilson". Letters do not include envelopes. 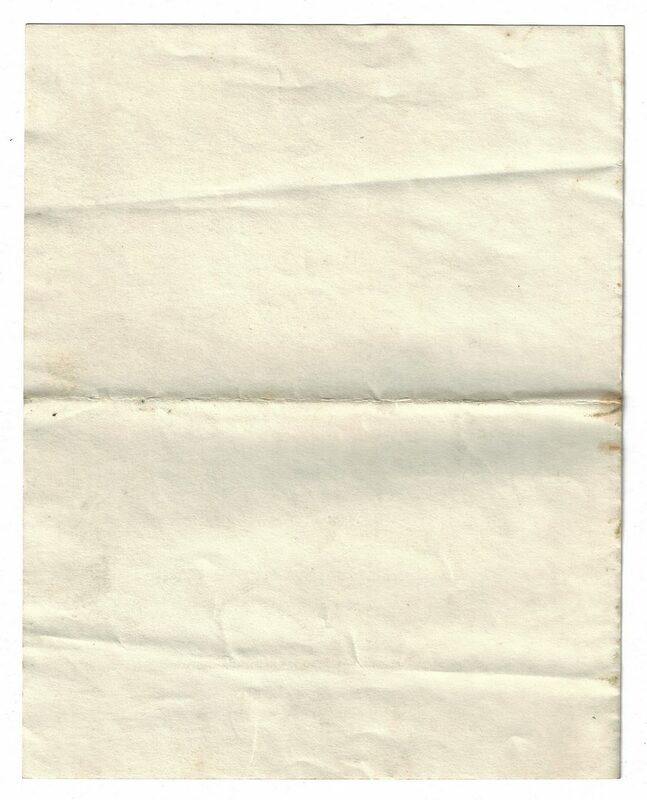 Approximately 9" H x 7 1/8" W. Provenance: The Estate of Charles Boyd Coleman, Jr., Chattanooga, TN, by descent from the Lewis M. Coleman (subject of this letter, b. 1861). Note: The Lewis M. Coleman of this letter (b. 1861) was the son of CSA Lt. Colonel Lewis Minor Coleman (1827-1863) and Mary Ambler Marshall, granddaughter of John Marshall (1755-1835), fourth Chief Justice of the United States. His wife was Julia Wingate Boyd, daughter of Annette Maria Dearborn Boyd, daughter of Greenleaf Dearborn (1786-1846) and great granddaughter of Major General Henry Dearborn (1751-1829) on her mother's side. Description courtesy of Stuart Lutz Historic Documents, Inc. CONDITION: Letters in overall good condition with light toning, fold lines, few minute foxing spots, to be expected from age. 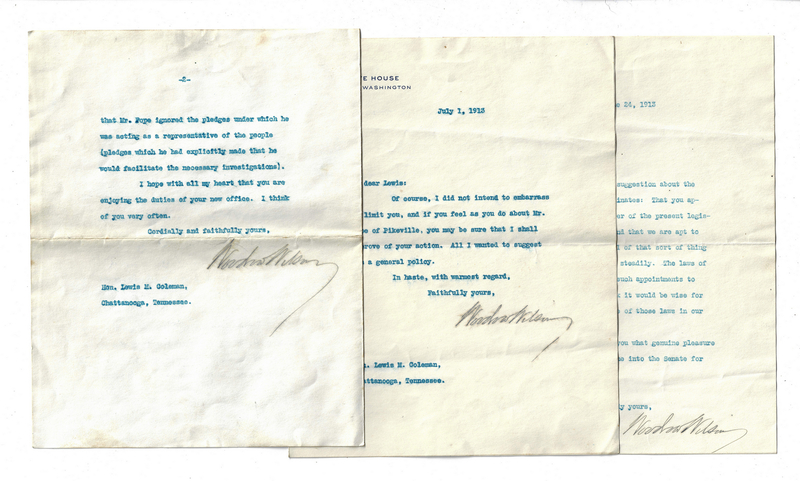 Wilson signatures slightly smudged but in clear and visible condition. Light wrinkling and an horizontal mailing fold. Letters do not include envelopes.